The robust flavor of this dark ale is not luck. It’s a combination of all the best elements of Irish coffee. It starts with our amazing Oyster Stout, which is based on an Irish Extra Stout, and is a full-bodied black beer with a delicious roasted malt character with flavors and aromas of coffee and chocolate. 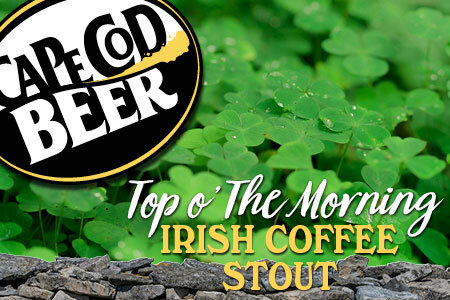 We then pair this beer with coffee that has been lovingly roasted locally by Cape Cod Coffee and infused with the sweetness of Irish Cream. This adds another layer of complexity and flavor to this next release in the “Get Roasted” coffee beer series. Sláinte!